I was quite surprised when the organizers of the World Assembly of Yang Sheng informed me that they would like to extend an invitation to me, as one of the VIPs and a representative from the scientific community, to attend the first Yang-Sheng international gathering. Not only was it a mere three weeks from the date it was to be held, but they asked me to give a talk on my choice of subjects related to Yang Sheng. I briefly discussed this with my family, and decided to cancel the vacation trip to a ski resort that we had planned and attend this unique conference on the subject to which I have devoted my life and research career. The first World Assembly of Yang Sheng was held at the International Conference Center, Orient Culture Park in Hangzhou, China, from December 28 to 30, 2011. Hangzhou is known as “Heaven on Earth” in China, due to its beautiful scenery and the comfortable lifestyle of the people who live there. 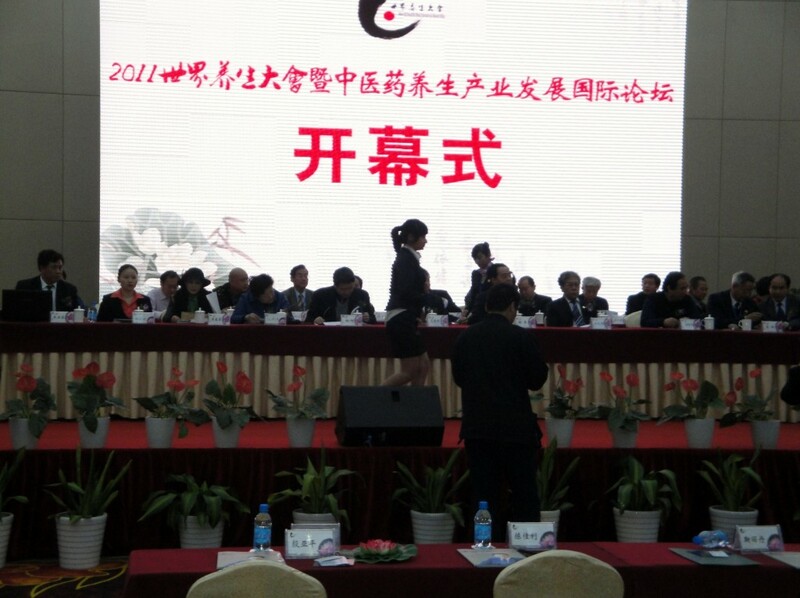 The Assembly was approved by a number of Chinese government agencies and directly supported by seven government and non-government organizations, such as Chinese Advancement for Scientific Creativity and Development, China Society of Chinese Medicine, CCTV Chinese Channel, Health Guidance newspaper, World Integrative Medicine Journal, and Chinese Branding Society. More than 700 participants attended this historical assembly. The majority were entrepreneurs who sell Yang Sheng products or provide services related to Yang Sheng. There were about two dozens participants from countries outside China including the U.S.A., Australia, Canada, Netherlands, Germany, Korea, and Japan. Most of the foreign participants were invited to be seated on the presiding stage as VIPs. Different languages with the same faith. To feel happy and healthy. May life be full of joy and sunshine. Different countries with the same dream. Flowers and songs on our earth. May the world be filled with peace and harmony. Standardization and regulation of national Yang Sheng and health maintenance products, and integrating them into national development plans. Promote the new advanced economic model, the 052525 commercial model. In my opinion, the World Yang Sheng Assembly was not an academic conference, nor an assembly for experience exchange among practitioners. It had a high profile in the media and press with strong government support. It was more like a special show to declare Yang Sheng as a unique field in health and medicine, and/or as an independent industry in economic development. The participants spent more time attending special events than listening to the conference presentations; these events included the colorful welcome dinner, the high-quality talent show, Yang Sheng product demonstration, multiple awards ceremonies, and the collective prayer for peace and harmony on Earth from the Confucian, Buddhist and Daoist leaders. For most participants, it was also a unique opportunity to network with other Yang Sheng practitioners, scholars and entrepreneurs. At the same time, many major presses and media in China reported the Assembly and related events. Even among people who did not attend the assembly, there was an awareness that the government might do something to regulate the Yang Sheng industry, and to promote a nationwide Yang Sheng movement. Although a few scholars attended and presented at the assembly, the focus of the Assembly was specifically on beauty (specifically beautifying of faces) and the anti-aging process. With the sponsorship of multiple Yang Sheng related companies, promotion of the Yang Sheng products by these companies took a large part of this gathering. The participants were surrounded by different Yang Sheng liquids, teas, and other products, from the welcome dinner, to the exhibition hall, to the actual assembly programs. I was told that this is a very popular model for organizing a conference in China — give the sponsoring organizations a lot exposure and opportunities during the conference, in return, the conference can collect enough financial support. Needless to say, there were few products there related to nurturing mind and spirit. The methods of focusing on mind cultivation or nurturing spirit and organizations devoted to doing that can hardly make enough money to sponsor a conference. However, my invited presentation, titled “Nurturing Mind is the Core of Nurturing Life,” was well received by the participants, and I got a lot of inquiries and written comments after my presentation. I believe that most participants agree with me on the importance of nurturing the mind, but it is the reality now that currently most Yang Sheng products are related to nurturing the body. In general, the assembly was very successful as the beginning of a healthy movement, and as a messenger to the world. However, most participants really wanted to actually get more information on Yang Sheng itself. It is interesting to notice that our Yang-Sheng magazine might actually add new light and hope to the community of Yang Sheng in China – more and more people around the world are interested in Yang Sheng theories, methods and techniques in Chinese medicine. This entry was posted in Featured Article and tagged world assembly of Yang Sheng, Yang Sheng International gathering. Bookmark the permalink. Congratulations, Kevin. This is so wonderful. You have made so many valuable contributions to qigong and energy healing, to mind and body “Yang Sheng” over the years. Thank you for all of the work you do, it is a very priceless gift to so many. I like the name of your presentation! It surely will receive increasing focus in the upcoming years, as much as the external “products.” Thanks for also keeping us informed and sharing this event with us.